Last summer, I had the worst breakout I ever had in my life. I got acne all over my face, including areas I rarely broke out in. And the pimples just wouldn't stop coming- it seemed like a new one was popping up every two days! During that time, I wore a lot of makeup to cover it all up. I went on a search for high to full coverage foundations and concealers, which probably wasn't the best idea since my skin was hypersensitive and my pores were very clogged already. But I didn't care, since all I wanted was to cover up my acne. Fast forward six months, my skin has calmed down completely. And my interests have changed as well. Back then my ideal foundation was one that provided full coverage and a flawless finish, ingredients be damned. However, about a month ago, I began searching for skin friendly makeup that would act like skincare while also covering imperfections as a foundation. And I'm happy to say that I've finally found the one: the Troiareuke Acsen A+ Cushion. What Is It: A skincare cushion foundation with SPF50+/PA+++. It contains 99% skincare and 1% makeup, featuring ingredients such as centella asiatica extract to heal your skin while also providing natural coverage like a foundation. This cushion contains multiple UV filters including both physical filters (titianium dioxide and zinc oxide) and chemical filters (ethylhexyl methoxycinnamate and octocrylene) to protect your skin from UVA and UVB rays. While UVB rays are the ones that play a role in skin cancer development, it's also important to protect your skin against UVA rays too since they can cause premature aging. Zinc oxide is the only one out of the four that offers protection against all UVB and UVA rays, while the other three offer protection against all UVB rays and only some UVA rays. 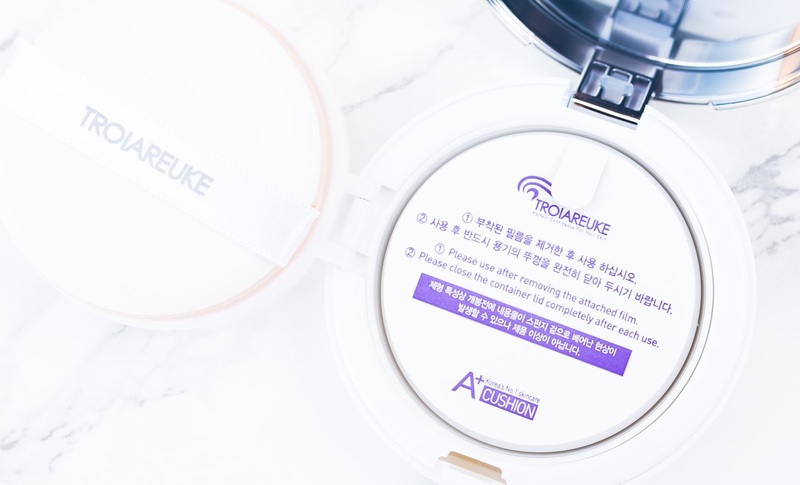 However, sensitive skin can have a bad reaction with chemical UV filters, so if you know that you have sensitivities to any chemical UV filters then I would advise you to stay away from this cushion. Niacinamide and adenosine are two ingredients in there that are beneficial for aging skin (and all skin types really!). While niacinamide is known for its ability to brighten and even out skin tones, adenosine is great for skin restoration and fighting wrinkles. Most importantly, the ingredients that make this cushion ideal for sensitive skin are calendula water, tea tree leaf water, and centella asiatica extract. All three are great for healing and soothing skin. Calendula is rich in antioxidants and has anti-inflammatory properties, while tea tree is commonly used to treat acne thanks to its anti-bacterial and anit-inflammatory properties. Centella asiatica extract is an ingredient that's becoming very popular for its ability to increase collagen synthethis and promote wound healing. Personally I'm a fan of all three ingredients, so I'm happy to see that they're included in this cushion. 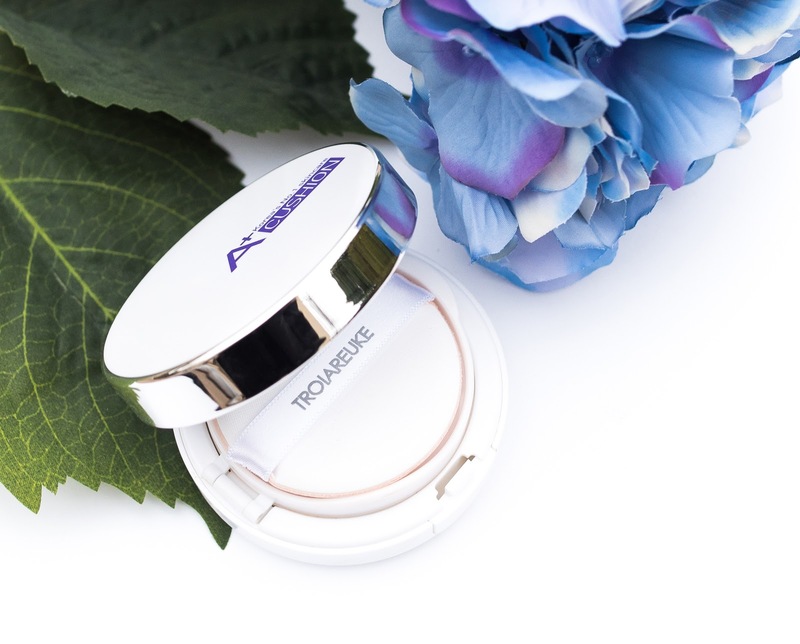 The Troiareuke Acsen A+ Cushion is housed in a white and silver plastic compact with the product's name printed in purple on top. Design-wise it's pretty boring, but I'm willing to overlook that since it delivers stellar effects. 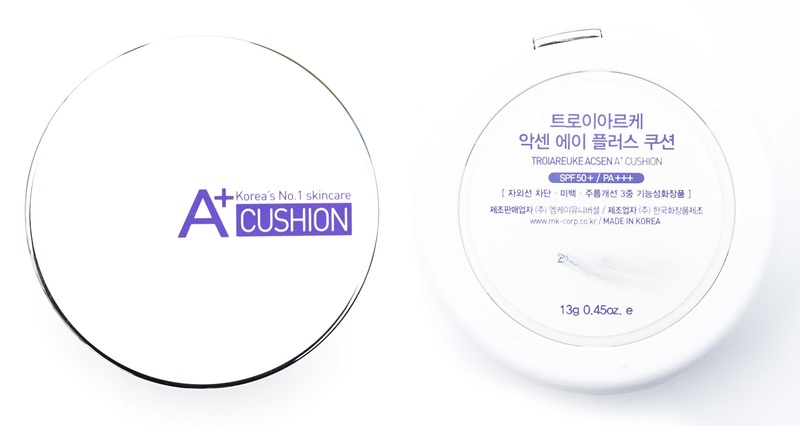 The foundation itself is contained in a "mochi" cushion, where unlike most cushion foundations where the foundation is already saturated throughout the cushion, the foundation is in the center of the cushion like a mochi. This supposedly keeps the foundation fresher, although I'm not sure if it actually makes a difference. This does have a fresh and somewhat floral scent, which I find quite pleasant and not overwhelming at all. It dissipates pretty quickly upon application, so those who are scent-sitive (like me) shouldn't be bothered by it. I've been using this cushion every day since the beginning of January and am seriously impressed! For the past year or so, I completely stopped using cushion foundations because most of them made my skin very oily at the end of the day, even if I used a sebum-absorbing powder. Although this one does make my skin look dewy, it doesn't make it feel oily. By the end of the day the edges of my nose do get a bit oily, but it doesn't look like the oily-mess my skin normally is after wearing a cushion for 6+ hours. When worn under a powder, some of its dewiness still comes through and gives my skin this subtle luminosity. The finish looks beautiful, and has this natural look to it that makes my skin still look like skin. Foundation tends to get patchy on my skin throughout the day since my skin is quite dehydrated during the winter, but this leaves my skin feeling (and looking) well moisturized the entire day. I've been using it in place of a moisturizer, and my skin has never felt dry. Texture-wise, it's extremely lightweight, and is similar to a watery lotion. My point is that it doesn't feel like foundation, and everything about it is more skincare than makeup. Except for one part: the coverage. Since it supposedly contains only 1% makeup, I thought the coverage would be quite sheer, but boy was I wrong. As you can see from the pictures above, it's between medium to high coverage. Although it doesn't completely cover my hyperpigmentation, its coverage is sufficient and I never feel the need to use concealer on top. What amazes me the most however is its healing ability. The first day I wore this I had a pimple forming, and by the end of the day it was pretty much gone! I've noticed that my skin feels soothed whenever I wear this, and my skin condition has only improved ever since I started using this as my sole base makeup. It's probably the only makeup that I'd feel okay falling asleep in (although I still wouldn't do it because I enjoy my night-time skincare routine more than anything else, and plus I have eye makeup to remove). Lasting power-wise, it's pretty good, but not spectacular. If you lean your face against your hand, it does transfer easily, so you have to make sure that you don't touch your face or rub it against anything to prevent fading. But if you don't touch your face and set the foundation with a powder, I've worn it for 10+ hours before with slight fading. I'm honestly not going pick on its lasting power because it's not marketed as a long-lasting foundation, but if you need a foundation that can go through a lot of wear (sweat, contact, etc. ), then this probably isn't for you. The one problem I will pick on with this cushion is that it's only available in one shade. If your skin tone is NC25-NC20 (and possibly NC15), this will match you really well since it's light with a warm undertone. NC30 skin tones may be able to make this work with a bit of bronzer, but if your skin is any darker than that then this'll be too light for you. I wish Troiareuke would create a broader shade range for their foundations, but sadly this is a problem that occurs with every Korean makeup company. I'm honestly obsessed with this cushion and will definitely repurchase this once I run out! I've actually gone ahead and purchased Troiareuke's other cushion, the H+ Healing Cushion, to make a comparison with this one. The only difference I know so far between the two is that the H+ cushion is shade no. 21, but we shall see how it goes. Overall, as the name suggests, this an A+ cushion for sensitive, acne-prone skin. If you're normally sensitive to foundation or break out easily from it, I highly recommend that you give this a try. Although this is suitable for all skin types, I think acne-prone skin will benefit the most from it. What do you guys think of the Acsen A+ Cushion? When it comes to foundations, what are your expectations? *This product was sent to me by Troiareuke for review purposes, but all opinions stated are my own and 100% honest.